Denny Hamlin started the Auto Club 400 in the pole position. He ended up in the hospital. In between there was a lot of good racing in Fontana on Sunday that culminated in Hamlin getting tangled with rival Joey Logano on the final lap and landing front-first against a wall. Kyle Busch wound up winning the race, with Logano hanging on for third place and Hamlin claiming 22nd. Hamlin was able to exit the car on his own but then slumped to the ground beside it. He was eventually airlifted to the hospital. “Hamlin qualified on the pole at Fontana; Logano was sixth. From the start, they were two magnets. It was in-your-face, side-by-side intimidation at 170 mph. “Everybody saw it coming on the last lap, especially Busch, the lost-in-the-shuffle champion, who zipped around the feuding pair to victory just as Logano squeezed to the right on Hamlin. 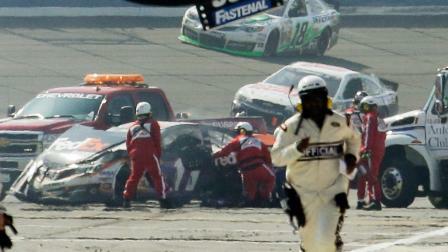 That sent both cars spinning and crashing and eventually sent Hamlin to a hospital, via helicopter. Take a look at the video above and let us know what you think. This entry was posted on March 25th 2013 at 5:24pm/17:24 and is filed under Live News Column 1. You can follow any responses to this entry through the RSS 2.0 feed.